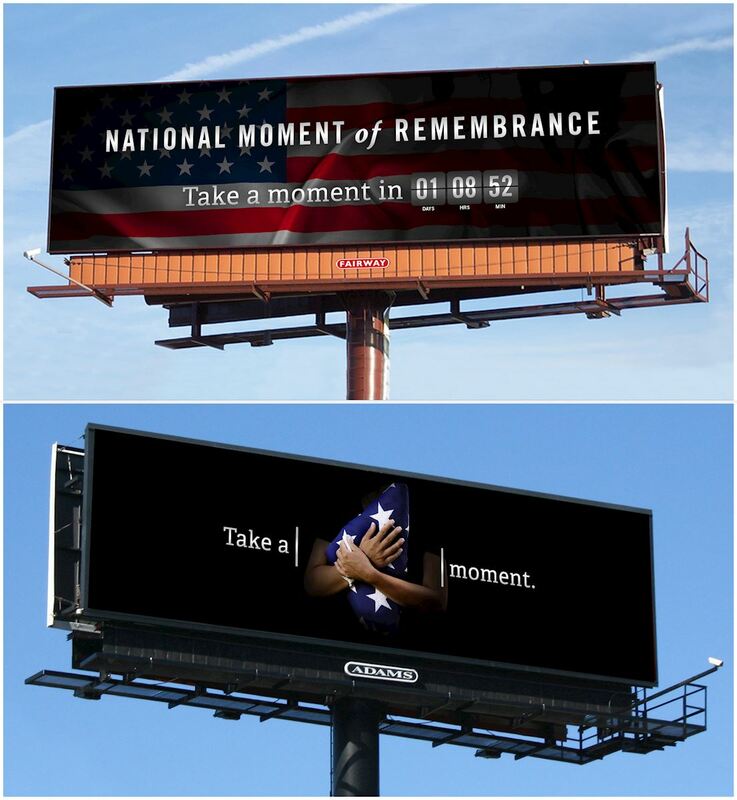 ATLANTA, GA (May 25, 2017) – On Memorial Day, May 29, Adams Outdoor and Fairway Outdoor will pause all advertising on 468 digital billboards in 21 states in honor of the National Moment of Remembrance. The little-known National Moment of Remembrance -- established by Congress -- asks Americans to pause in national unity for one minute at 3 p.m. local time on Memorial Day Adams+Fairway will build awareness for this event by starting a countdown on its digital billboard network from Thursday morning to 3 p.m. Monday. At that time, all of Adams+Fairway’s digital displays will halt the advertising rotation for 15 minutes to show a message encouraging viewers to “take a moment” to remember and reflect on the brave men and women who have sacrificed their lives for our country. The National Moment of Remembrance campaign will continue to run in regular rotation on digital billboards through Memorial Day in markets throughout Georgia, South Carolina, North Carolina, Tennessee, Alabama, Virginia, Pennsylvania, New Jersey, Michigan, Indiana, Illinois, Wisconsin, Minnesota, Iowa, Texas, and Arkansas. Because of digital out of home’s efficiency, Adams+Fairway’s creative teams often develop timely relevant messages for holidays and breaking news. Three of these messages, tributes to Muhammad Ali and Prince, and a celebration of Teachers Appreciation Week, recently won OBIE Awards for creative excellence in out of home from the Outdoor Advertising Association of America.